This morning on The Clay Aiken News Network they are, yet again, reminding me of another Clay Aiken tour that I missed out on - The Jukebox Tour. I have watched an immeasurable amount of clack from this tour, but I had never watched any from the Tom's River Venue, so last night I did. The first thing I noticed is that this venue must not have been very clack friendly - it would appear that SecretlyLovesClay was filming from inside of a bag? Also, there was not a lot of video and very few photos. When you're talking Clay Aiken fans, this is just not a good sign. I also noticed that the videographers weren't exactly sure what Clay was going to do next -as the tour progressed and they became more familiar with the Songs & Medlies - the clack got better (if you ever have a chance, check out SecretlyLovesClay, Elvis Medley, Vermont). 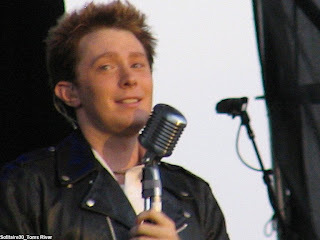 But, as any good Clay Aiken fan will, I tried anyway - here's a montage of the 50s Medley - all video filmed at Tom's River (with thanks to Joanne, SLC, wmmah, & Deborah760 for the wonderful video & audio). Now get ye to The Clay Aiken News Network and watch the videos over there so you can get a visual of the history of clack, Jukebox Tour Edition - you'll be glad you did! Sue, thanks for the memories! I loved the JBT tour!!! I will never forget when Clay walked out in that leather jacket and black pants and walked down the steps. My daughter was with me and she got this huge smile on her face that stayed there the entire concert! Clay Aiken will do that to you! I would love for him to do a JBT2! As another poor soul to not see the JBT live, the clack from it is a lifesaver. I just love it! The Juke Box Tour was truly one of my favorite Clay Aiken memories. Great blog. The Clack goddesses are unbelievable for preserving these memories of Clay Aiken. Kudos to all. My tours are through clack. Thanks to all the clackgatherers. I adored the JBT. Clay Aiken was, is and will always be amazing!! Thanks for the video! Sue....thank you for this wonderful blog. I really love the Jukebox Tour. It was amazing. I also appreciate the link!! I loved the JBT. I saw 3 of them and could have seen 10 more. What talent Clay has. So.much.fun!!! I want more. Fun video and blog about Clay Aiken's jukebox tour. I loved the tour and was able to see it more than once, but didn't get to Toms River. Was lucky enough to attend the first, Tom's River, and the last ones at AC, and many in between!!! I LOVED the JBT and would be thrilled to see a JBT2!! Absolutely my favorite tour of all! Loved the JBT!! Love Clay Aiken!!! Thanks for the video. It brings back amazing memories! The video from the JBT is great Clay Aiken really rocked out!!! I loved Clay Aiken's interpretation of the different decades. Great!! Awesome blog about Clay Aiken's Jukebox Tour opener! Love your montage. Thnx for the memories. Thank you, too, for your kind remarks in the Carolina blog. Have a great weekend! Aw Sue. I never saw this tour either. Thank God that Clay Aiken allows fans to video his shows. CLACK RULES! I was lucky enough to see this concert in Cary NC. It was wonderful and I can hardly wait for Clay Aiken's next concert series. I saw Clay in Valdosta for the JBT. 7th row. The closest I have ever been in concert, or any other appearance, except for the handshake lines after the SRHPT. It was also the first time he did stump the band. I remember going back to the room that night and finding the picture of the giraffe taking food from Clay's mouth. Oh, to be that close to Clay's mouth. Lucky giraffe.